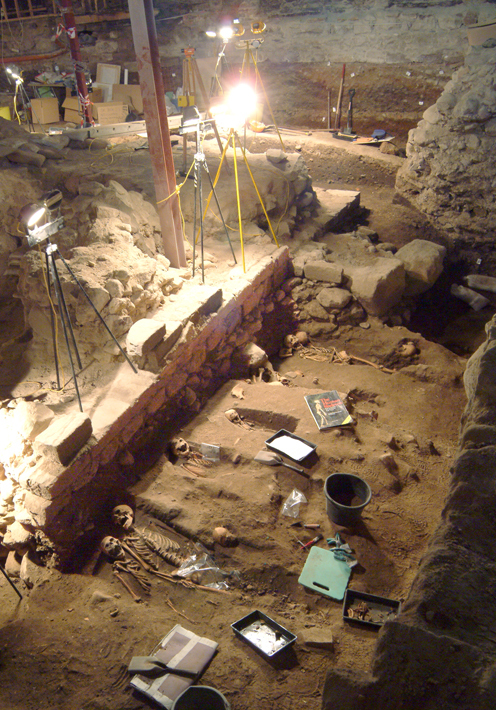 It was known that there had been earlier buildings beneath the floor of the former East Kirk. What was not known was how much had survived subsequent building works. 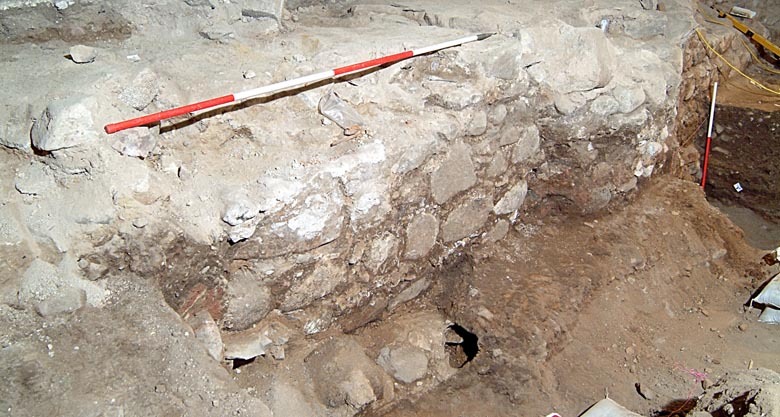 What emerged in the dig was that there were the remains of all these buildings – and more besides! In a dig of this sort, not all the walls which were uncovered could be retained – otherwise, we would not have known of those below – but we do have extensive photographic records. For each stage of the history of the building some of the walls have been retained and will be available for people to see when the project is complete. The lower levels of the Choir (the east end) of the 12th century church were uncovered. Indeed, it was found that the eastern part had probably slipped down the slope of the Putachie Burn valley and had to be rebuilt about half a metre to the east of the original. This new wall was made of beautifully dressed sandstone with buttresses. The photograph shows this wall as it was being exposed (diagonally across the centre), with the wall of St Mary’s Chapel lower right below the photographer. Some of the burials between the church and the ‘new’ St Mary’s Chapel were just starting to be uncovered. There is another photograph of this area in the human remains section. When the church was expanded in the late 15th century, the builders used these existing walls to help stabilise the foundations on which the pillars of the new Choir were built. Thus some of both the south and north walls of the 12th century church had been replaced with large boulders to support the massive pillars carrying most of the weight of the new church. The picture shows two of these curved bases separated by the flatter 12th century wall. Some of the 12th century walls have been retained where they abut the walls of the Drum’s Aisle (the transept of that church) as shown in the next picture. There had been some writings in the mid-nineteenth century which indicated that the authors had seen a curved apse during the demolition and rebuilding of the East Kirk. This apse was uncovered during the dig as shown in the centre of the photograph.The walls at the left by the vertical pole and extreme right are part of the later 12th century church. 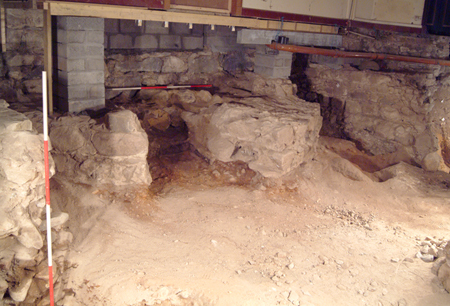 More work is required to establish its age more accurately, but it pre-dates the 12th century building and is probably the oldest exposed wall in Aberdeen. It was surrounded by more than 20 children’s burials and also retains the mortar floor. Unfortunately a later burial has removed some of the stones (in the centre of the picture) but it is a striking feature which will be accessible in the finished building. 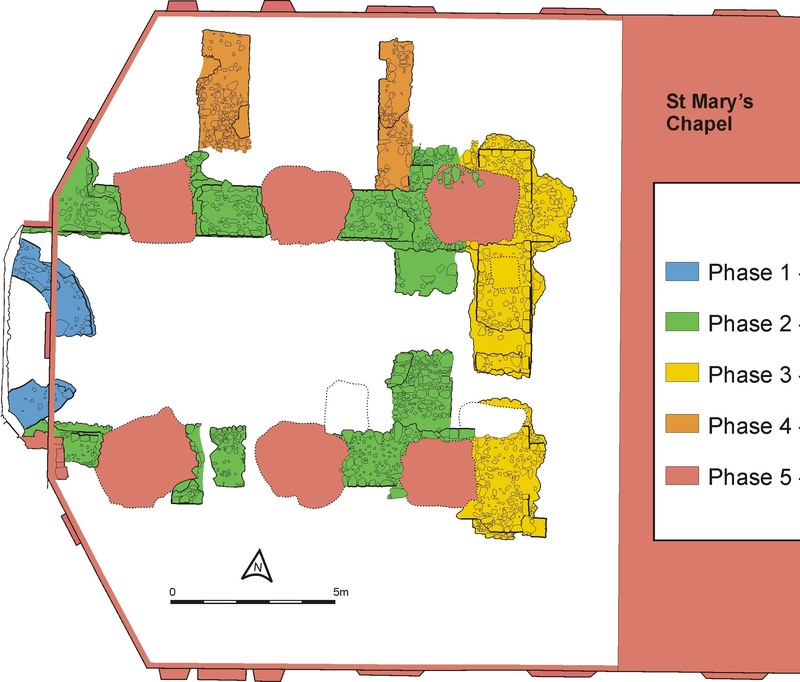 The following drawing was produced at the time of the archaeological dig and shows the different phases in the building and expansion of the east end of the church. The exact dates for these phases is not yet fully known, so these have been left off this version of the plan, but they are in chronological order.